Anyway, I used the same tutorial as before - the one by The Twiddletails Blog - which I really like. But.... I learned a couple of things in making these.... things I need to remember for next time! 1) Pay attention to directional fabrics. Unfortunately, I did not, and on all of these, I'd really intended for the pattern to go the other direction. Just remember that the WOF (41") goes around the pillow, so depending on the orientation of your print, you may want to purchase a little more fabric. 2) The other thing, is that the seam where the main, contrast, and trim fabrics all meet is thick! I found using my walking foot for those final couple of seams worked really well. 3) Lastly, just a note that if you are wanting to make queen or king size pillowcases, see the pdf version of the tutorial, as it gives the measurements for those larger sizes. The purple set above I made king-size and they turned out more than generous. So just fyi! I really want to make more! Great tips about the directions of the prints and seams. I can see how these might be quick, and additive, makes! 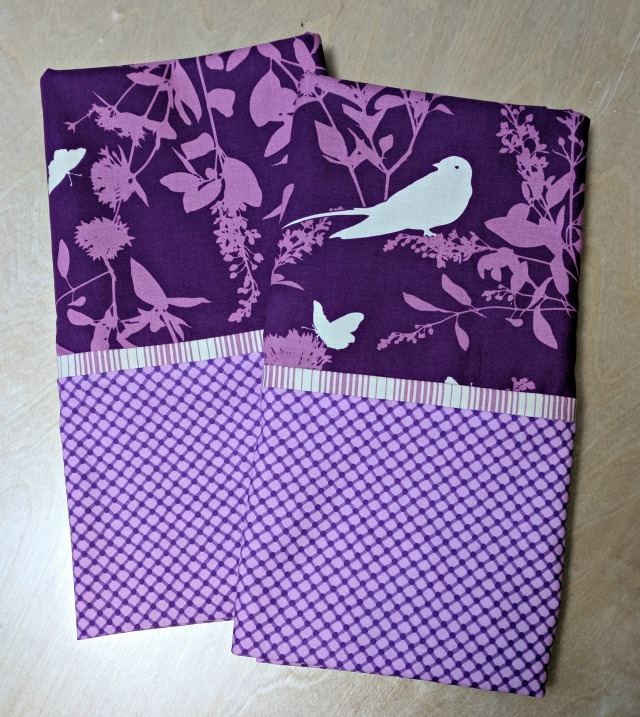 I enjoy making pillowcases but it requires trips to the store or online shopping because I rarely buy that large of a piece of fabric "just because" but those purple pillowcases have me itching to make a few! A shopping trip might just be in order. Pillow cases are a great gift. The Halloween fabric is a little scary, (I'm smiling). Little ones can be sensitive, they're so cute. I agree, thanks for the tips, it's good to know before hand. My first pillowcases were ages ago - Christmas ones for my young niece and nephew to enjoy in the run up to the Big Day. 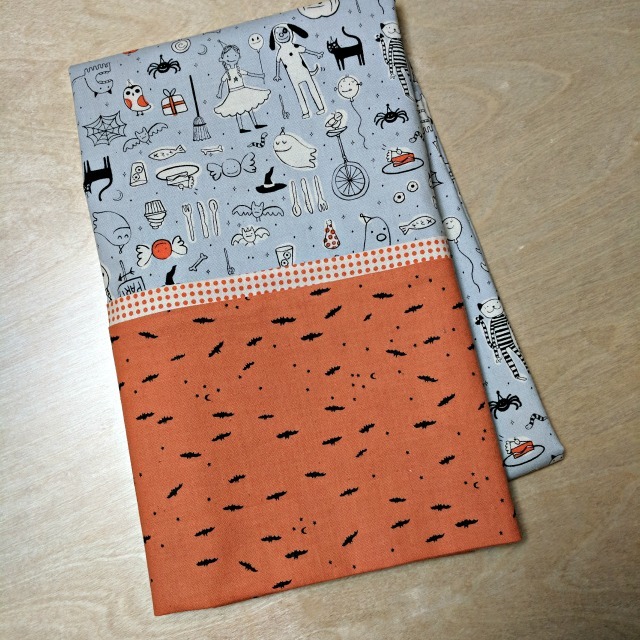 Now, I often make them to go with a quilt I'm gifting and slip the quilt inside for "wrapping". Thanks for the tip on the walking foot, smart idea. My quilt bee just made a mountain of pillowcases a couple weeks ago. Several of us learned a new technique. Fun! I make pillowcases every year for family and several charities. Yes that seam where all three fabrics meet is quite thick. I use my vintage Singer 15-91 and Jo-Jo sews through anything. I will be making about 50 pillowcases this year for holiday gifting and will be using a vintage Kenmore I recently picked up. I hope it sails through that thick seam easily. Can't wait to make some of these for my little grand baby when he gets a little older! Thanks for the tutorial link! I enjoy making pillowcases too. When the fabric is directional, I like to have the design horizontally across the pillow case instead of vertically. In order to do this, I buy 1 1/4 yards of the main fabric, and cut it 27" (cross grain) x 40" (selvedge edge). The cuff and the contrast piece go on the selvedge edge instead of the cross grain edge. Love your purple pillowcases!! I made a couple of pillowcases for my bed a few years ago and it was really fun. I was actually thinking the kids would get handmade pillowcases this year for Christmas. Should be fun to pick out the perfect fabric for each one of them!